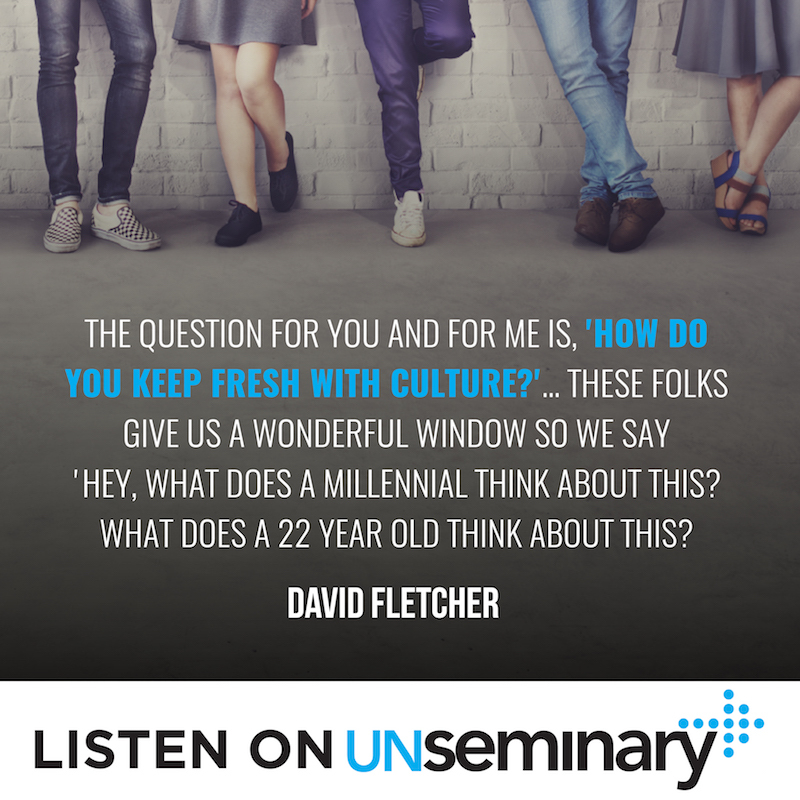 Hey, everyone, and welcome to this week’s unSeminary podcast. We’re happy to have you with us as we talk with David Fletcher. He is the executive pastor at EvFree Fullerton in California and also runs a ministry called XPastor. EvFree Fullerton is a historic church where Chuck Swindoll once pastored. As he became well known, more people came to the church to hear him speak and so EvFree grew. Chuck moved on to other ministry opportunities, but the church continued to prosper and has had great pastors over the years. One of the things, however, they have maintained a passion for is learning how to give ministry away and empower the next generation to lead. David is here to talk with us today about how they do that at EvFree Fullerton and the challenges as well as the rewards. Align your budget and vision. // If your church wants to take on the process of training up the next generation of ministry leaders, David recommends that you have your budget and vision in mind before you begin. Know how much your church can spend on hiring these short term staff along with how much you’re already spending on long term staff. Let your long term staff know that they are valued, even if you don’t have as many long term staff members as you once did, but part of their role is to mentor the next generation and prepare them for ministry. “You have to say, ‘Hey, here is the amount of ministry dollars that we may never see great fruit on,” David says. “But it’s not about the work, it’s about the training.” You can get a lot of great stuff from these people, but their best years may be somewhere else. You can learn more about EvFree Fullerton at their website www.evfreefullerton.com, or reach David and learn more about his organization at, www.XPastor.org. 00:37 // Rich introduces David Fletcher and welcomes him to the show. 01:11 // David talks about the history of EvFree Fullerton. 02:18 // David talks about their process of empowering the next generation. 05:22 // David talks about their budget versus their vision. 07:21 // David talks about how the church stays fresh with culture. 10:02 // David gives examples of two trainee XPs and the impact they have had on EvFree. 12:13 // David talks about their annual review process. 14:03 // David talks about releasing the trainee XPs at the end of their training. 16:22 // David highlights the benefits of investing time and money in trainees. Rich – Well hey everybody, welcome to the unSeminary podcast, my name’s Rich, the host around these parts. So glad that you’ve decided to tune in today, you know every week on unSeminary we try to cover a wide variety of topics to help you with some of the practical stuff that’s going on at your church. Today you’re in for a real treat, you’re going to be so glad that you’ve put us in your earbuds today, we’ve got David Fletcher with us. He is just a fantastic leader, he is the executive pastor at EvFree in Fullerton, California. He also runs a ministry called XPastor.com, which you might be familiar with them, they have a conference, they do all kinds of stuff. So welcome to the show David. David – Hey, good to be with you, thank you. Rich – So glad that you’re here today. Now why don’t you tell us about EvFree Fullerton, kind of give us the story, give us a sense of the church and your role there? Rich – You’ve maybe heard of him. David – He was really one of the first mega radio famous preachers. David – So back in the day they used to have a buses of tourists come to the church on Sunday morning. David – So the church grew as a large church. Chuck left, went and became the president of Dallas Seminary, Dale Burke was here for 14 years and then Mike Erre was here for 3 years. Mike did a lot of missional things, very catalytic, very prophetic in his style and now we’re in a transition and we’ll start a search soon, but one of the things that Mike and I really resonated together on, and loved doing ministry, was on how to give ministry away and empower the next generation. David – I’d love visit with you guys for just a few minutes on that. Rich – Yeah very true, I’d love to hear more about that. Obviously one of the things that churches struggle with is handing off ministry to the next generation. What are you learning, how are you kind of facing the challenge of mentoring younger staff and leaders? David – Well, I added it up this morning, because I had never really put a pencil to it and about one third, 11 out of 30 of our ministry staff will only be with us for 4 years intentionally. 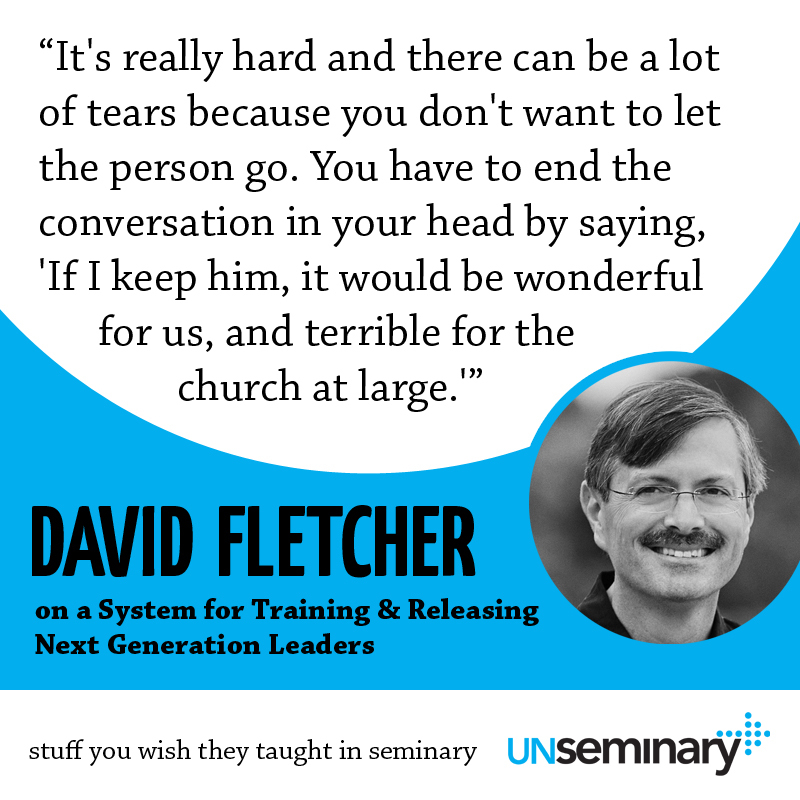 David – And they know that because we want to train them and release them and we want to cry when they leave because it’s really hard but we want to see them launch because seminaries are great, but wait, I’m talking to unSeminary, but we know what the seminaries aren’t covering. So no one in seminaries are teaching somebody how to do my job to be an XP. David – Similarly youth pastors, so we have 7 folks, 3 in junior high, 4 in high school ministry, who are going to be with us for 2 to 3 years; train them, release them. Then we have another 10 or 20 interns I haven’t even included in that mix, that are just with us for a year, mostly volunteer, a few paid. But we really believe in empowering the next generation and success is not that everybody goes into vocational Christian ministry. David – Success is that Jesus remains in the front seat, the driver’s seat of the car and that they decide not to put Jesus in the back seat as just a ride along for the rest of their life. Rich – Well let’s dig into a couple of things you said there. So now, you’re intentionally, this feels like a fairly controversial idea, intentionally training up staff to let them go, to release them, to send them to other places. Rich – Why would you do that, that seems crazy? You’re investing in them, you’re investing kind of relational capital in them and then you’re saying, “Okay, go. Get out of the nest.” What does that look like? David – Well you just hit it right on, it’s wonderful and you get some of the best and brightest, but you have to be ready from the get-go that they’re going to leave, that this is a short term position because, well one, church is really expensive for a lot of fulltime staff over the long haul and the schools aren’t doing it, so who’s going to train up this next generation of pastors? Rich – Interesting. So then, do the people that attend your church, do they have a sense of, “Hey, some of these people aren’t going to be with us very long,” or does that kind of run in the background as a leadership issue? David – It’s not hidden, it’s not a hidden agenda and it comes out from time to time. So the listener is going to hear it, some people will be surprised when some of these folks rotate off. Rich – Right, and I think, particularly in some of those roles, having say a youth person stay for 4 years is about right. There’s a lot of churches would kill to be able to have a guy stay for 4 years, because it seems to be a high turnover area. Giving some purpose behind that, to train and then release, I think is a fantastic idea. David – Well even before you get into the role you have to start with your budget and vision. David – You have to have the orientation that we value long term staff, we just may not have as many as we had at one point in time, but we highly value long term staff, but their role is to mentor and coach the people of God to be a believer priest, not to only do ministry but really to give it away and then to give it away to the next generation. Then you have to align your budget and you have to say, “Hey, here is a certain amount of ministry dollars that we may never see great fruit on, like with interns.” We get a lot of work out of them but it’s not about the work, it’s about the training and on these folks we may get a lot of their great training years, we get a lot of great stuff out of them, but their best years may be in 10 years, seeing the experience that we give to them. Rich – Where do you find these individuals, are they coming right out of school? Give me a sense of the profile of this kind of role. David – Well we’re close to Biola University and Fullerton University and Fullerton College and Hope University. So we have a lot of universities, so we have undergraduates and graduates; so there’s Talbot, there’s Rosemead School close by, there’s Fuller. So we have a rich pool to call up on and there’s just a lot of people that want to explore this ministry thing, in the youth positions for a couple of years and then in the more advanced positions, many of those are post-seminary. Rich – Interesting. Now I would imagine, almost like a teaching hospital, that having this kind of influx of people on a regular basis is going to, in a good way I think, challenge you to experiment, to try new things, because you’re bringing in kind of newer ideas. Give me a sense of what’s happening on that front at your church, what have you experienced on that front? David – That’s really the beautiful part of it, the question for you and for me, because I’ve been in ministry now almost 35 years, is how do you stay fresh? It’s Heraclitus’ line from Ancient Greece that you can never step into a river twice because it’s always moving. So how do you keep fresh with culture when I don’t have a fulltime job to just go and understand modern culture? We recently had a 22-year-old guy preach our evening service, part of that preaching team and we kind of get a picture of, “Oh, this is what resonates there and this is what doesn’t work for him,” then we need to be sensitive to that. Rich – Interesting. Now I would imagine a big part of this… It sounds great, we want people to challenge, we want great ideas to bubble up. Is there a time where maybe some challenging from one of these ministry staff maybe didn’t go so well and what did you learn from that experience? David – I would love to tell you, you know pull out a story where it hasn’t gone well, but frankly we experiment, we give people full, all the rope they need; “Hey, go and try this,” and failure is not an option, meaning it should happen. If we aren’t failing at some period, then we aren’t pressing hard enough into new and unchartered territory and we have very robust discussions. So if somebody raises an issue, let’s say a 22-year-old guy raises an issue, well then I may look at a 30-year-old guy and say, “Well, what do you think about that?” Let the two of them sort it out, I don’t have to be the arguer on everything. David – Then empower and challenge and if it’s a safe place, I never want someone to fail in an unsafe place. Rich – Yeah, I can see where creating an environment, particularly an environment where you provide some guardrails, so it’s like, “Here’s kind of where we’re headed,” and a safety net that, “It’s okay if this doesn’t go well,” is critically important as we move forward in training and releasing younger staff for sure. I would imagine a part of that is then how you structure the job description and what their responsibility looks like. Can you give us an insight into what that looks like? David – Well they have a fully formed job description with plenty of responsibility, so I’ll give you an example. John Hurst, grad of UCLA, grad of UCLA Law School, high marks in that, was working for a firm down in Irvine making a huge salary that you and I could never touch. David – But he wanted to get back in ministry, because he had been on a crusade and God had been tugging at his heart since college. David – So when we opened up this 4-year position for an assistant XP, he applied. We didn’t know him from Adam. So we turned over the HR department to him, teaching him Ops. This year he ran the entire budget process for every staff member. David – Freed up my schedule tremendously. David – He’s revolutionized our HR department. He oversees all things legal and contracts. Just yesterday he and Eddie, I’ll talk about Eddie in a second, visited a church, the name will come to me, it’s in Santa Monica, West LA, oh it’s a great new… it’s a church plant. David – Lorenzo Smith and Casey out there, Collective Church, there I knew I’d get it. David – I was thinking Borg and that’s not right. Rich – Resistance is futile. David – So we’re building in him but we’re also learning from him. So Eddie’s another guy, Eddie has a Th.M. from Talbot and came on as an assistant XP. He’s helping oversee operations but also along the way we’ve discovered, he knew it but we didn’t know it, this brother could really preach. He’d never preached in a mixed-race environment because he comes from a Korean church and kind of took him a message or two to get used to that and what fun we’re having with Eddie. Rich – Very cool. That’s very cool to hear, that’s nice to get kind of an inside scoop, get a sense of what that looks like. On the job description side of what you do, is there like an annual process where you go through it at your church, I’m sure there is, where you review that and make sure that things are structured in the right way? What does that look like for you guys? David – Everybody gets an annual review and part of that annual review is looking at the role description and I believe in honesty in the role descriptions. So I want percentages of time because ministry is so fluid. David – It’s like, “Rich, what do you do on a given week?” For me, I probably work 40% on leadership issues, probably 30% on elder issues, another 20% on problems and 10% on ministry. So then we look at that and actually I put it up on Apple TV in my office, I do a paperless office; no desk etc. So I just put them up on the screen and I say, “So Rich, here’s what was last years of yours, what do you think should be up this year?” So it’s a dialog we enter into, we do some correction that they may or may not enjoy, but it’s right, straight face to face with their supervisor during that review process. Rich – That’s a great tip that hopefully people are picking up there. You talked about, not just, “Here are the things you should be working on, but “Let’s weight them from a time and output,” not just the time but also the results, “Okay, this is what we really need you to focus on in this coming year,” that’s fantastic. David – Well you have to do that, if we believe that our vision statement should be reflected in our budget first and then in our people’s time. So how is our vision statement being reflected in what this person is doing? Because I can’t handle a three-page task list. David – It’s like, I don’t know what that really means. I’ve got a one-page role description sorted and weighted by percentages of time, now that makes sense to me. Rich – Very cool, very cool. Well, when you actually get to the releasing of these leaders, what have you learned in that process? You know, when it actually comes down to the, okay they’re stepping out, they’re going to go and do something else, how do you do that in a healthy way that honors them and honors the church? So I’m 56 and that means I only get like, in trainee XPs, I only get like 2 or 3 more cycles of this, so I better give it away now. David – You cry over it but then you also prepare them and you help them with their resume, you help them with contact, you are their references. What better reference? Rich – Oh it’s huge. David – Where we can say, “Oh Rich and I worked together for 4 years, it’s a 4-year position, I love him tremendously, but he now needs to go and lead an entire church, this is not the right place for him any longer. Rich – Right. Well the thing that I love that you’re pushing on, your challenging us here today, I think particularly in these kind of senior roles, executive pastor, maybe even lead pastor, a lot of times we don’t have clear models of what that looks like to replicate those people, because we say, “Yeah, I’m training people around me but I’m going to be here for a long time, I’m not going anywhere,” which is my sense from your story, there’s no plan on going anywhere. So how do I train people and actually release them? I love what you’re kind of laying out here to say, “No, this is ultimately about getting them to step out in other places,” and I totally agree on the reference thing. If you’ve done any hiring in the church, you realize you get these people and their resumes and a lot of times their supervisors aren’t on that list of people to call and every time they are, that person goes to the top of the list in my book. David – Yeah, we want to be their champions. Anything else you want to share on this before we pivot into the last part of our episode, the Lightning Round? David – It’s a lot of fun, it’s a lot of hard work, it’s a lot of investment, but I think the person who grows the most is me, they’re just feeding into my life, you know? You can look at the whole Reverse Mentoring book, man I’m just learning all the time and one of the reasons that I stay in ministry is for guys like this, they’re just so much fun to be around.